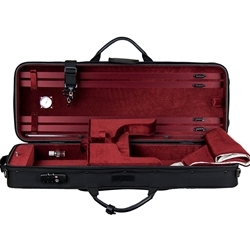 Protec's Professional Viola PRO PAC Case features a soft wine velvet interior, string tube, suspension padding, hygrometer, TSA lock, adjustable shoulder block that holds viola up to 16.5", English bow clips, built-in rain jacket, and a luxurious velvet blanket. Each case offers a shoulder strap and a large exterior pocket for sheet music. Fits violas up to 16.5"